Taming Wildflowers is a seductive celebration of wildflowers overflowing with lush photos from the author’s 100 acre flower farm. The ultimate DIY book on wildflower gardening, Taming Wildflowers is jam packed with practical information: How-to grow wildflowers from seed, identify wildflower seedlings, build a wildflower cutting garden, harvest fresh wildflowers, dry flowers, design wildflower floral arrangements and create a magical wildflower wedding. 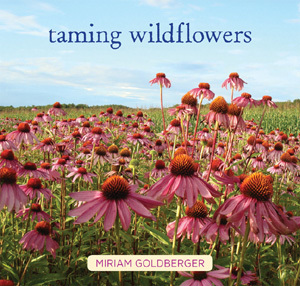 Author, Miriam Goldberger takes her readers on a wildflower ride! From wildflower tattoos to wildflower weddings you will love this visually stunning and utterly practical book.